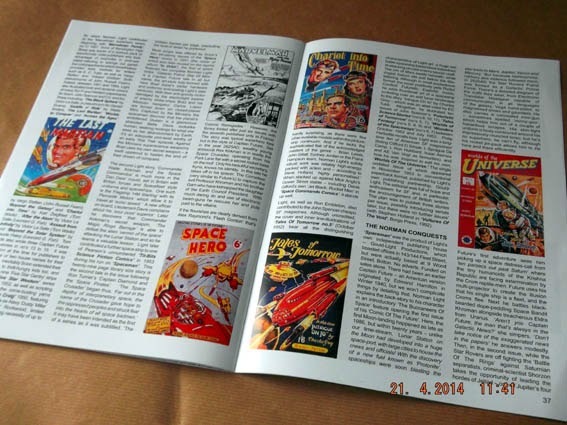 A new issue of Spaceship Away has recently been published and contains a good mixture of material. 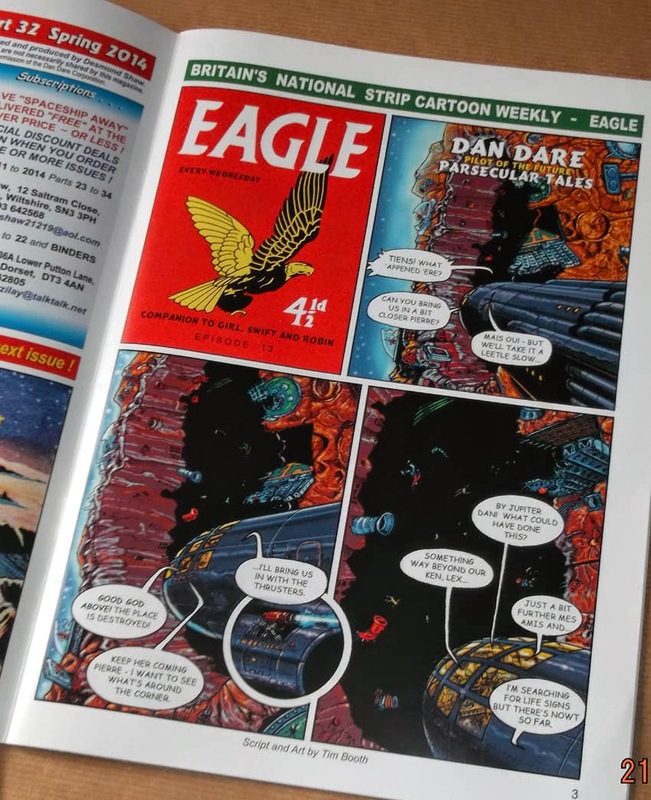 Firstly it boasts a cover, centrespread, and back cover newly drawn by veteran Dan Dare artist Don Harley, reproducing memorable scenes from the original Eagle weekly. It's pleasing to know that Don is still drawing and can produce such excellent pieces of work. Inside, the 40 page issue kicks off with episode 13 of Parsecular Tales, a brand new classic style Dan Dare strip written and drawn by Tim Booth. As always, the first page is designed in a nice homage to the 1950s Eagle, - fourpence ha'penny price and all. The six page story has impressively detailed artwork but I felt it needed a resumé caption at the start to clue readers in on the story so far. Spaceship Away is only published three times a year and it's asking a lot for readers to remember the plot of a serial at such infrequency. I've missed a few issues and I found myself struggling to understand all the whys and wherefores of the story. The same applies sadly to Shadow Over Britain, a reprint of a 1950s serial from (I think) Express Weekly. It's episode ten, but no resumé, so again a big drawback. Considering the price of each issue is £8.50 it would take the sting off a bit just to help new readers along. I would also question the use of Comic Sans as a lettering font. Notorious in the comics industry for being a poor font. There are many far better comic lettering fonts available. OK, that's the downside of the comic. There are many positives which easily outweigh those negatives. 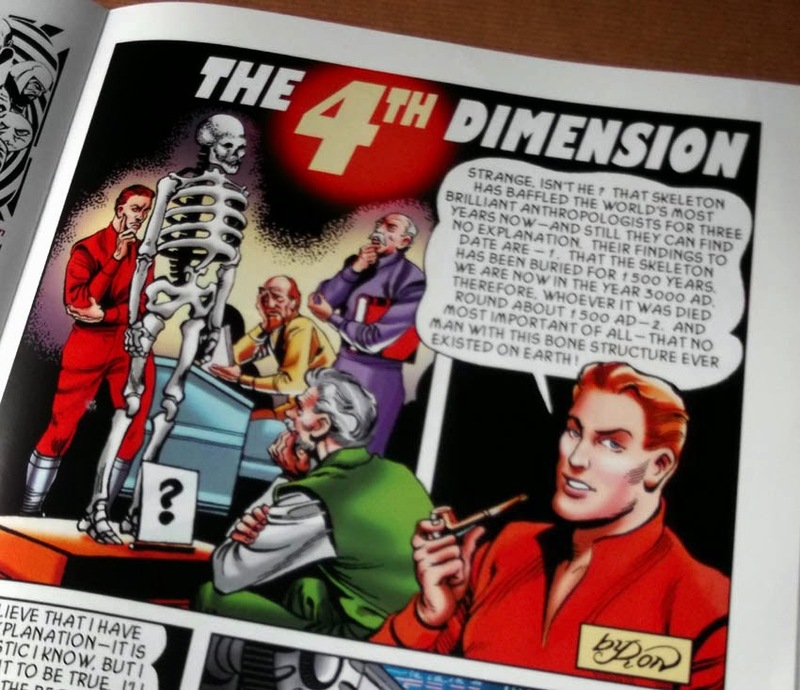 It was great to see an early Ron Embleton science fiction strip from the 1950s. (Original source not given.) Newly coloured by Martin Baines (and lettered with a better font that Comic Sans) it's a cracking 8 page story with a great twist. There are also three well researched articles in the issue. 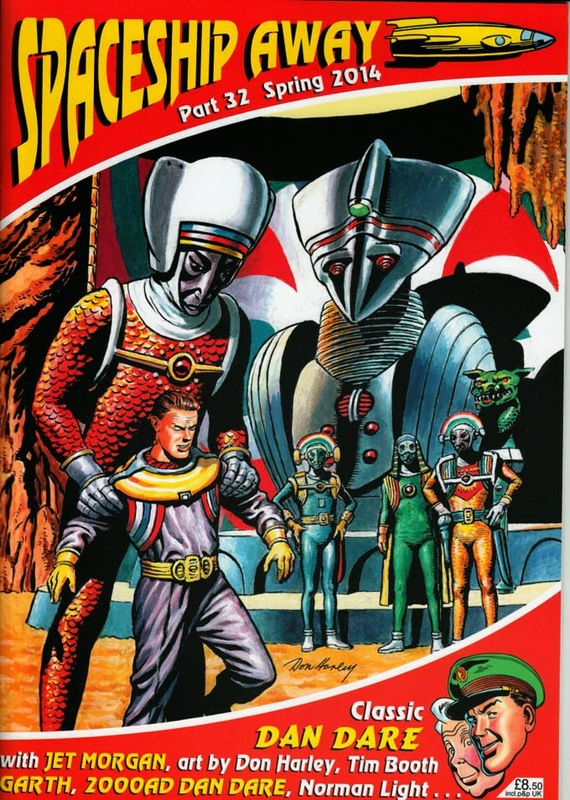 The first looks at the 2000AD version of Dan Dare from the 1970s, which is often unfairly dismissed by Dare purists. The strip had a lot going for it, particularly the strong artwork by Massimo Belardinelli and Dave Gibbons, so it's good to see it being given its due. Rounding out the issue is a great feature on Norman Light's comic strip work of the 1950s. This is very welcome, as independent comics from this era are sometimes overlooked by comic enthusiasts. In addition there are photo features on the Dan Dare Rocket Gun and a superb Phant model. As mentioned earlier Spaceship Away is not cheap, but remember that the more limited a print run is, the higher the unit cost is to produce each issue. Also, the printing standards are top notch, with a laminated cover and full colour glossy interior stock. Although a fan publication, it actually looks better quality than many High Street magazines.